The International Maritime Bureau (IMB), the anti-maritime crimes arm of the International Chamber of Commerce, has released its 2011 Piracy Report. The Report is compiled on the basis of the incidents of piracy and armed robbery worldwide reported to the IMB. 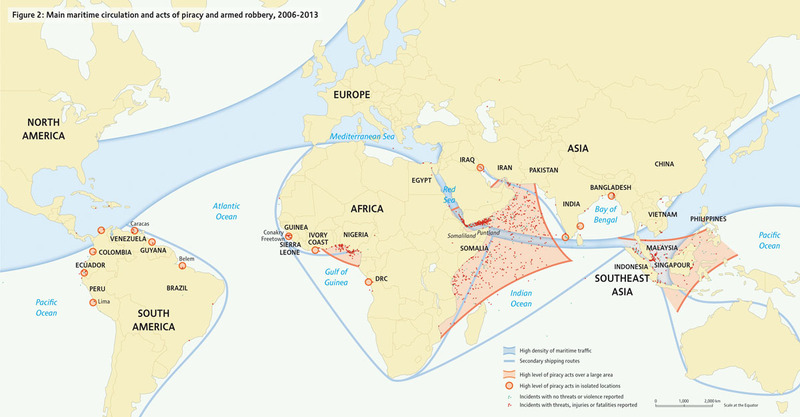 Not surprisingly, pirate attacks against vessels in East and West Africa accounted for the majority of the world attacks, with Somali pirates accounting for more than 50% of these. Out of the 439 attacks reported in 2011, 275 attacks took place off the coast of Somalia and in the Gulf of Guinea. There are fears that pirate attacks in West Africa in 2011 were underreported. The total number of pirate attacks fell only slightly from 445 in 2010 to 439 in 2011. Overall, in 2011 there were 176 vessels boarded, of which 45 were hijacked, and 113 were fired upon, in addition to 105 attempted attacks. While the number of Somali incidents increased from 219 in 2010 to 237 in 2011, the number of successful hijackings decreased from 49 to 28. The last quarter of 2011 shows an even more significant drop. However, these numbers do not take into account attacks on dhows and smaller vessels which are often targeted by pirates and may also unwittingly end up serving as motherships. These figures echo a recent positive trend already signaled by the International Maritime Organization. 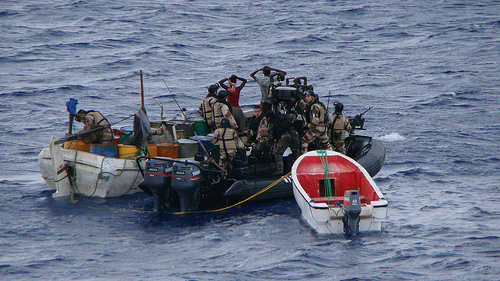 According to the IMB, this is mainly attributable to the presence of international naval forces in the Gulf of Aden, the enforcement of the IMB best practices (such as the use of citadels, sprinkler systems, and other active defences) and the deterrent effect of the employment of privately armed security personnel on board. Will these positive developments continue in 2012? Further up to date figures are also available from the International Maritime Bureau piracy reporting centre. During 2011, the IMO engaged at various levels to bring about a solution to piracy and related crimes, particularly concerning the protection of both ships and seafarers as well as the enhancement and enforcement of maritime law. Most notably, the IMO dedicated this year world maritime day to the theme of “Piracy: Orchestrating the Response” and launched a campaign directed at improving coordination among States, the private sector, international and non-governmental organizations to tackle piracy. The changing nature of modern day piracy and other forms of armed robbery at sea, its increasing links with other forms of organized crimes, the deeply rooted social causes at their basis as well as their impressive economic impact have given a new dimension to the phenomenon. We have referred to this as transmaritime criminality. While the falling of piracy related numbers in the Somalian hotspot is certainly a welcome news, the IMO understandably warned of the risk of becoming complacent with these positive results. Success in combating piracy remains contingent on the local situation on the ground which, in the case of Somalia, remains unstable. Current signs of criminal activities, particularly the risk of these spreading into West Africa, call for a continuing engagement with the process stakeholders. This should also be aimed at developing a comprehensive and holistic approach towards all facets and root-causes of transmaritime criminality.